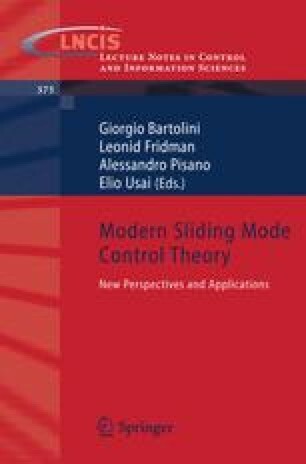 Discrete sliding-mode control has been extensively studied to address some basic problems associated with the sliding mode control (SMC) of discrete-time systems that have relatively low switching frequencies (see [2, 3, 4] and references therein). However, the discretization behaviors of continuous-time SMC systems have not been fully explored except some early results in [5, 6, 8]. The Euler discretization method is commonly used for digital implementation and simulation of SMC systems . It is of practical importance to understand the behaviors of Euler’s discretization of SMC systems in order to evaluate ‘deterioration’ of performance such as chattering, which is a well known problem in SMC and other switching based control. Furthermore, understanding of the Euler’s discretization of SMC will help understand discretization effects of other discretization methods such as the zero-order-hold and the Runge-Kutta method. In , the first study of Euler’s discretization of the single input equivalent control based SMC systems was carried out and discretization behaviors were fully explored. It was found that only period-2 orbits exist.